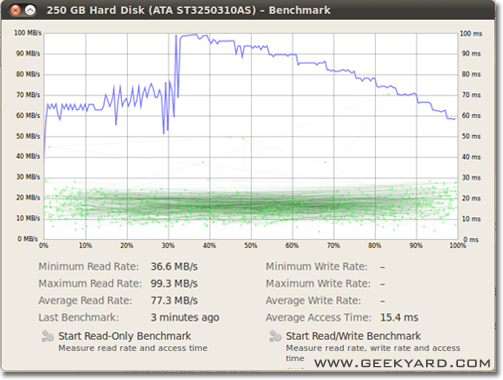 How to check the performance of a hard drive (Either via terminal or GUI). The write speed. The read speed. Cache size and speed. Random speed. hdparm is a good place to start. sudo hdparm -v /dev/sda will give information as well. dd will give you information on write speed. If the drive doesn't have a file system (and only then), use of=/dev/sda. Otherwise, mount it on /tmp and write then delete the test output file. Go to System -> Administration -> Disk Utility. Select your hard disk at left pane. Now click “Benchmark – Measure Drive Performance” button in right pane. A new window with charts opens.You will find and two buttons. One is for “Start Read Only Benchmark” and another one is “Start Read/Write Benchmark”. When you click on anyone button it starts benchmarking of hard disk. Is there something more you want? I would not recommend using /dev/urandom because it's software based and slow as pig. Better to take chunk of random data on ramdisk. On hard disk testing random doesn't matter, because every byte is written as is (also on ssd with dd). But if we test dedupped zfs pool with pure zero or random data, there is huge performance difference. Another point of view must be the sync time inclusion; all modern filesystems use caching on file operations. That is over 100MB/s lower than with caching. If you want to monitor the disk read and write speed real-time you can use the iotop tool. This is useful to get exact information about how a disk performs for a particular application or task. The output will show you read/write speed per process, and total read/write speed for the server, much similar to top. bonnie++ is the ultimate benchmark utility I know for linux. It takes care of the caching, syncing, random data, random location on disk, small size updates, large updates, reads, writes, etc. Comparing a usbkey, a harddisk (rotary), a solid-state drive and a ram-based filesystem can be very informative for the newbie. I have no idea if it is included in Ubuntu, but you can compile it from source easily. A bit more at: SIMPLE BONNIE++ EXAMPLE. Check integrity, detect fake flash drives and test performance, all three in one shot. More on this AU answer. Not the answer you're looking for? Browse other questions tagged hard-drive performance or ask your own question. Why doesn't /tmp use tmpfs? How do I check the integrity of a storage medium (hard disk or flash drive)? How to check file-level write performance? Tips for debugging Samba performance? Can an external flash or hard drive be used to boost performance, similar to Windows' ReadyBoost? How to check the disk activity of my hard-drive? How do i check which process is reading hard disk?